On Tuesday, the mercury climbed across the nation, hitting 39.3 C in Mino, Gifu Prefecture, while at least two people died in Kagawa and Kochi prefectures after showing symptoms of heatstroke.. 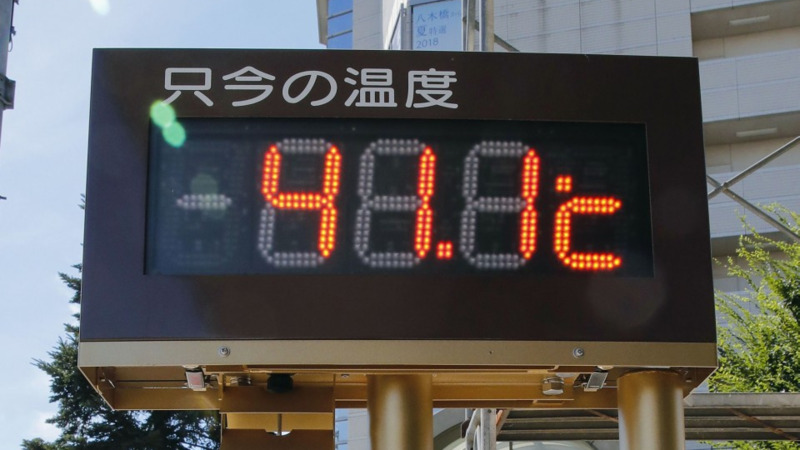 The Japan Meteorological Agency warned that high temperatures are expected to continue Wednesday in western Japan and elsewhere, calling for taking preventive measures against heat-related illnesses by replenishing water and salt, and staying cool indoors. According to the education ministry, nearly 60 percent of 820,000 classrooms in the country's public elementary and junior high schools were without air conditioning as of April last year. In the reporting week, 22,647 people were taken to hospitals. Tokyo accounted for the highest number at 1,979, followed by the prefectures of Aichi at 1,954, Osaka at 1,779 and Saitama at 1,617.